It is the weekend, and even though most people post their celebrations on Saturday, I'd like to post mine today. Thanks so much to Ruth for hostingall of these celebrations and giving us a forum. It's March and time for the Slice of Life Challenge as well! Thanks so much to the entire crew at Two Writing Teachers for organizing and hosting this massive event! You are all rock stars! I have much to celebrate this week! I recharge myself (or "fill my tank" as my friend Stella says) in many different ways, and this week's celebrations all led me to be recharged each time. I'm quite grateful for all these events. First, our daughter who has been job searching for awhile, interviewed and got a job this past week! We are incredibly excited for her as she begins this new phase of her life tomorrow morning bright and early. Knowing that she has a job she's looking forward to, and that she can make her own, recharges me as her mom. 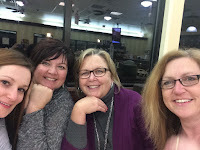 Second, I got to spend time with dear friends Wednesday evening. We call ourselves the Porches and Patios group. But, we could just as easily be called the "Queso" group. Whatever we call ourselves, getting together with these amazing ladies always leads to conversation, sharing, celebrating, and laughter. Lots and lots of laughter. We began as a group discussing PD; we've become dear friends. How blessed I am to recharge myself when spending time with these ladies. Finally, I gave myself the gift of time yesterday. Everyone was going to be gone from the house, and I had it all to myself. Along with the gift of time came the gift of silence. No TVs on, no music, no conversations - just the chirping of birds and the normal hum of the neighborhood could be heard as I opened some doors and windows. And with that time and silence, I wrote. I read. I napped. I took an hour and a half walk. I showered. I read again. By the time my husband came home at 4:30 PM, I was recharged and looking forward to the dinner we were going to with good friends. I hope your week was full of celebrations and opportunities to recharge as well. Sounds like you had the perfect day yesterday, Karen! I hope to have one of those over spring break. Your PD/patio/queso group sounds like so much fun! It's important that we have connections like this in our lives. So glad you took the time to rest and recharge. I sighed when you spoke of the silence. We all need that sometimes. Happy Writing! I love that all of your Queso group gets together, looks like a lot of fun. And your day to seems to be wonderful for you. Nice week, Karen. Reading your post I sensed so much peace and joy. Celebrate! Love that you gave yourself the gift of time. And thanks for that great photograph - reminds me of my time with all of you in Dublin. Sounds like the perfect weekend! Recharging is so important - I love when I get the house to myself and a whole day to fill! I wish we lived closer so we could crash your porches and patios PD! What a wonderful week and a very special day, Karen. Congratulations to your daughter. Now that's a lot of celebrations! So happy for Kate. A new beginning for her. Love that you had some down time. My celebration is that I wrote this weekend and posted on ASCD site. Sent you the link. You are an inspiration!! Looks like there is plenty to celebrate. I'm so grateful for our time together this week. I found it energizing as well. I enjoyed hearing about your day home alone. It sounds like the birds in your neighborhood must be returning as well. I went outside to find the black birds were chirping in loud chorus from the trees in our yards. There were so many of them. Congratulations to your daughter on the job offer. That's wonderful! Nice to see your smiling faces in that pic.